Hot rocks are not recommended for iguanas! Not only are hot rocks inadequate in providing heat, but they are dangerous. There have been numerous cases of iguanas obtaining serious burns from hot rocks. Heat and light should come from above, since in the wild iguanas bask in the sunlight. Ordinary incandescent light bulbs work great to provide both heat and light. You do not need to purchase expensive “basking bulbs” from the pet store. These are no different than ordinary bulbs. What wattage of bulbs you will need depends upon the ambient air temperature of the room and the size of the enclosure or basking area. Do not guess when it comes to temperature! It is imperative that you install a few good, reliable thermometers at various places in the enclosure to give you an accurate temperature readout. You can also hook up dimmer switches to your lights, which will allow for minute temperature adjustment. Hooded clamp fixtures work well for basking lights, come in a variety of sizes and can be positioned in various ways within an enclosure. Be sure to use fixtures that are designed to accommodate the bulb wattage you are using. If you are using high wattage bulbs (150-250W), you must use a fixture with a ceramic socket to prevent fire hazard. Be sure to place the fixtures in such a position that your iguana cannot climb on or touch them. If you place the fixtures inside the enclosure, it is a good idea to add a wire “bulb guard”, such as you see in the photo below, to prevent your iguana from coming into direct contact with hot bulbs. Bulb guards can be made from hardware cloth or other safe types of wire. If you have a smaller iguana that is likely to climb up on and/or cling to the light fixtures, consider placing the fixtures outside of the enclosure. This simple bulb guard was made from a small piece of hardware cloth, which is held in place by the simple guard that came with the fixture. The edges of the wire have been bent under so that no sharp edges are exposed. Nighttime heat – Like all other animals, iguanas must have a day/night cycle. We recommend a 12:12 or a 13:11 cycle. This means that you must shut your iguana’s lights off at night for 12 or 13 hours, or better yet, have them on a timer that turns them off at night and on again in the morning so you do not have to remember to do it. This allows the iguana to regulate behaviors and rest peacefully when necessary. Not providing a day/night light cycle can stress an iguana, causing behavioral changes such as feeding, pooping and unnecessary aggression. Iguanas can and should have cooler temperatures at night, but they still need ambient air temperatures to fall no lower than 75-78ºF. How then, do you provide best heat lamp for iguanas, if you use light bulbs to heat the enclosure? There are a few methods of providing nighttime heat. One of the best is to use Ceramic Heat Emitters (CHEs), which screw into an incandescent light fixture and give off only heat, not light. These are available in different wattages. It is possible to have a set up where the lights come on in the morning and turn off at night, and the CHEs come on at night and turn off in the morning. Another possibility is to use a low wattage CHE 24 hours a day in addition to the daytime lights. Since iguanas can and should have cooler temperatures at night, a CHE of the appropriate wattage should provide adequate nighttime warmth. A word of caution about CHEs – they get very hot and can be fire hazards and/or dangerous to your iguana if not used correctly. Be sure to use them only in fixtures with porcelain or ceramic sockets, and keep them away from dry wood or fabrics that are flammable. Be sure to place them in a way that will not allow your iguana to come in contact with them, because their surfaces get very hot and can cause severe burns. Use only the appropriate extension cords that can handle the amount of wattage you plan to plug into them. A CHE can be an efficient and safe source of heat for your iguana, but only if you use them properly. Be sure to read all of the directions and cautionary statements supplied by the manufacturer. Be safe, use your common sense, and above all, be careful – not only with CHEs, but with other heating and lighting devices as well. In addition to CHEs, there are other methods of providing nighttime heat, such as letting your iguana sleep on a human heating pad wrapped in a soft towel. It can be dangerous to use heating pads for long time periods unsupervised, so CHEs are probably the better way to go.Some people use nighttime blue or red light bulbs to provide warmth at night. Some iguanas do not mind this at all, while others are bothered by the light and have trouble sleeping. You may want to watch your iguana carefully for signs of stress if you decide to try these nighttime bulbs. In addition to these heating methods, many herp supply stores carry items such as “pig blankets”, radiant heat panels, and heat tape, which may be appropriate nighttime heat sources for your iguana’s enclosure. It is a good idea to explore all options to help you decide what will work the best for you. Iguanas require a source of UV radiation, specifically UVA and UVB. 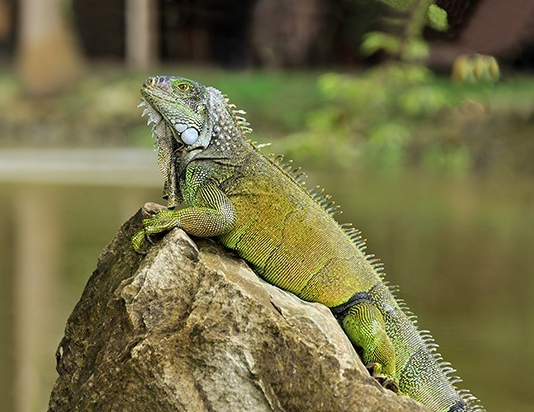 UVA is used by the iguana, just like humans, for a general sense of well-being. UVA is necessary to keep the Iguana happy and feeling good. UVA is easily supplied to your iguana through window glass or your standard room lighting. Providing a source of UVA like window exposure or room lighting will satisfy the UVA requirements for your iguana. UVB is the tougher of the two to supply. There are many fallacies concerning UVB sources and it is very important that you know quite a bit about it and how it works. Being a diurnal creature (awake in the daytime), iguanas are basking reptiles that require a strong source of UVB (in a very specific range) in order to properly synthesize Vitamin-D, which allows them to absorb calcium from their digested foods. Without proper calcium metabolism, the iguana’s system will begin to use calcium from the bone structure in order to satisfy the requirements that keep their nervous system functioning properly. This leeching of calcium from the bones weakens them over time and causes a serious and often fatal set of illnesses including nutritional secondary hyperparathyroidism, fibrous osteodystrophy, rickets, osteomalacia, and metastatic mineralization, all relating to the common term Metabolic Bone Disease (MBD). To better understand the way UVB is used by your iguana, please read Calcium Metabolism in Iguanas by Dominick Giorgianni. UVB from natural sunlight is filtered out by most window glass and significantly reduced by obstructions like screen or mesh. Preferably the ambient temperatures outside should be close to optimal. Do not leave your iguana outside if temperatures are lower than 80 degree and higher than 100 degrees. Be sure your iguana is secure in its outside basking location, preferably a basking cage. Unprotected or unsecured iguanas can fall prey to birds and other wildlife or run off and are rarely ever found again. You should supervise the iguana while outside until you are sure there is no possible way him it to get harmed, injured or escape. Be sure to provide plenty of shade for the iguana while outdoors. Iguanas need to thermo-regulate to protect against excessive heat. Half of the basking cage should be sunny, the other half well shaded, allowing the iguana to move from sun to shade at will. Be sure to provide a good source of water during the basking time. Iguanas can quickly dehydrate and will need access to clean water at all times while outdoors. Provided there is a shaded area, the iguana will stay at a comfortable temperature and the amount of sun exposure will be determined by the iguana. As little as an hour a day will provide the iguana with all the UVB it requires. The use of artificial UV bulbs or lamps in your iguana’s basking area is strongly recommended – especially if you live in an area where your iguana cannot bask in the sun every day. UVB lamps are a hotly debated topic and the better educated you are, the better off your iguana will be. It is important to remember that not all UV lamps are created equal! In this regard the old adage, “Let the Buyer Beware” is very pertinent. Many ill-advised or unscrupulous companies will advertise that their lamps provide the proper levels of UVA and UVB for basking reptiles. While these lamps can provide a source of useable UVB, they vary greatly on the amount and how long it will last. There are currently two types widely available of lamps that will emit enough UVB light to be beneficial to your iguana: Fluorescent tubes and Mercury Vapor lamps. Both of these types of UV lights can be purchased at pet stores and can be ordered from herpetological suppliers such as those listed on our Companies and Stores page. By far the most widely used and accessible type of UV bulb or lamp is the fluorescent tube. Just like natural sunlight, these tubes need to be set up and used responsibly in order to provide your iguana with the life-sustaining amount of UVB it needs to live a long, happy and healthy life. Several brands of fluorescent UVB lights are available, but not all brands are of equal quality. The Green Iguana Society recommends the ZooMed Iguana Light 5.0 (also called Reptisun 5.0). This bulb has been on the market for some time and has been shown through studies to provide large enough amounts of UV light to keep your iguana healthy. We recommend that you mount two ZooMed 5.0 bulbs in a high-quality fluorescent fixture to get the best results. Ordinary “full-spectrum” fluorescent bulbs (such as plant-grow bulbs) do not produce adequate amounts UVB! Only bulbs especially made for reptiles do. When selecting a fluorescent lighting solution, please be sure to choose one that is specifically made for basking reptiles and all is rated for high UVB emissions. The fixture should be no more than 8” from the basking spot where the iguana spends its time basking. UV wavelengths only travel up to 8″ or so from the bulb, so if your iguana sits any further away than 6-8″, it will not get the benefit of the UV light. Light, heat and ambient air temperatures should all be balanced and monitored to ensure a safe environment for your iguana. Tube output should be periodically tested using a Solarmeter 6.2 Spectral radiometer. For more information about the Solarmeter 6.2. Solarmeters are also available through Carolina Pet Supply. Without a meter, it is best to replace the tubes every six-nine months because after this time, the UV degrades to the point that it is no longer useful, although the bulb still produces visible light. One bulb changing schedule that works well is to put fresh bulbs in around the time when real sunlight basking time is becoming scarce, such as in the fall for those that live in northern climates. The bulbs are then at their full strength when your iguana is relying more heavily on the artificial UV source. Then, when the bulbs’ UV output in dwindling in the spring and summer, your iguana is getting plenty of access to real sunlight. Multiple tubes may be necessary to emit the proper levels of UVB. The ballast contained in your fixture may affect the UVB output. High-quality fixtures with an electronic ballast will get the best performance out of an UVB tube. There can be no obstruction of the light emitted from the fluorescent tubes. This means that no glass or plastic cover or shield should be used. The light must go directly from the tube to the iguana. Glass and plastic filter out UVB wavelengths. Mercury Vapor lamps (bulbs) are a newer way to provide your iguana with UVB rays. Mercury Vapor (MV) bulbs screw into an ordinary light fixture like an incandescent bulb. MV reptile lighting technology has advanced by leaps and bounds recently and is now a cost-effective, viable solution for an artificial UVB source, and in some cases is even better than fluorescents. MV lamps produce up to three-times more UVB in the 290-300 nanometer range (D-UV, the most beneficial to the iguana) of the total UVB output than tube-style bulbs. There has been great debate over the safety and usefulness of this type of lighting source. As the technology continues to advance, manufacturers are beginning to address safety concerns and stability and significantly decrease the “hazards” of mercury vapor lamp use. It is important to realize that there are two types of MV bulbs: those with an internal ballast, and those with an external ballast. Although both give off high amounts of UVB, these two types of bulbs are actually quite different in their properties. The internally-ballasted bulbs are the type more commonly sold at pet stores and include brands such as Mega-Ray, T-Rex Spots and ZooMed Powersuns. Internally-ballasted MV bulbs give off heat as well as UVB. In this way they are convenient because you can provide your iguana with both heat and UVB from one bulb in one fixture. However, the internally-ballasted bulbs have a high failure rate, regardless of the bulb brand. Because the bulb gets so hot, the fragile filament breaks easily if the bulb is jiggled while it is on. The externally-ballasted bulbs are not as easy to find, but they are sturdier and have a much lower failure rate than the internally-ballasted bulbs. This is because they do not give off much heat, so the filament does not get as hot. In this way, the externally-ballasted MV bulbs are more similar to the traditional fluorescent tube, and therefore additional, separate heat bulbs must be used in the enclosure. Based on current research, the Green Iguana Society strongly recommends the Mega-Ray MV bulb by Westron lighting/Mac Industries. Of the different types of mercury-vapor UVB bulbs available, the Mega-ray consistently gives off high amounts of UVB and has a lower UVB decay rate than other bulb brands. In addition, externally-ballasted Mega-rays are also available. Set up your MV lamp according to manufacturer’s guidelines and instructions concerning placement and distances. Closely monitor the iguana and enclosure to ensure proper temps are maintained. Be mindful of the bulb’s direction and placement in a room so as to minimize the exposure to humans. Because they produce high UVB levels, treat a MV lamp like natural sunlight. Excessive and prolonged direct exposure by humans is not desirable. Monitor the UVB output using a Spectral Radiometer (UVB meter). Strong MV lamps should only be used in conjunction with a radiometer to measure UVB output on a regular basis. As with fluorescents, there should be no obstruction of light between the lamp and the iguana.